While referenda and elections in the UK and the US have always been of interest to those of us in the Eastern hemisphere, the unforeseen rise of populist nationalism manifested in Brexit and the US presidential poll has stirred a greater interest in elections in four European nations, and their impact on the rest of the world. Anti-immigrant sentiment and Islamaphobia sweeping across the US were corroborated by the very loud voice of Republican nominee Donald Trump as he took to his campaign podium to denounce President Barack Obama’s policies on immigration and border security. Trump’s approval of Brexit and threat to exit NATO, as well as his overt criticism of the EU and German Chancellor Angela Merkel over her open-door policy on immigration, are sentiments that have resonated in Europe. The wave of immigrants entering Europe, and bombings and shootings in Paris and elsewhere, did not bode well for European governments that embrace centrist policies. In contrast, it had the opposite effect on far right-wing political actors who wasted no time in capitalising on the deteriorating security situation in Europe. What exactly is meant by far right-wing politics? The Concise Oxford Dictionary of Politics says that in liberal democracies, the political right opposes socialism and social democracy. And right-wing parties include conservatives, Christian democrats, classical liberals and nationalists. On the far-right, one will find racists and fascists. And while we know about racists and racism, what does fascism mean? The definition says it’s an authoritarian and nationalistic right-wing system of government and social organisation. Not very scary, is it? But wait until you hear what the synonyms are – authoritarianism, totalitarianism, dictatorship, despotism, autocracy, Nazism and militarism. Sounds familiar now, doesn’t it? 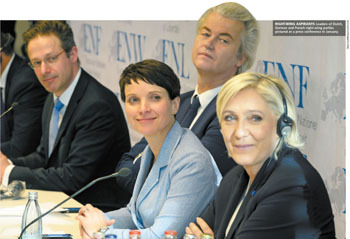 As many countries in Europe gear up for elections, the world is seeing the emergence of far-right-wing politicians whose charisma and rhetoric are shaking the very foundations of European liberalism. Acts of terrorism are largely attributed to immigrants who are also believed to be the cause of rising unemployment in Europe. This bleak landscape is fertile ground for ultra-right-wing politicians to enter the ring while spouting anti-immigrant and Muslim rhetoric, and fanning ‘Euroscepticism.’ The right-wing feeds off the terror of their people and offers them a sense of hope in sharp contrast to the lacklustre assurances offered by their governments. Up until the end of February, the extreme right-wing seemed to be gaining ground rapidly. But early March saw a paradigm shift that was heralded by the Austrian elections in December. AUSTRIA On 3 December, Austria went to the polls and it seemed that right up until they closed, the extreme right-wing candidate Norbert Hofer of the Freedom Party would be victorious. But at the eleventh hour, Austrians rejected him and his policies, and as The Guardian noted: “The leftist’s win was hailed as the ‘liberal pushback’ against Brexit and Trump.” But at 46 percent, Hofer’s support base is still quite formidable. HOLLAND The Netherlands went to the polls on 15 March to decide whether they prefer the ‘hope’ that Geert Wilders (of the Party for Freedom) promised or the status quo of the incumbent Mark Rutte (People’s Party for Freedom and Democracy). Wilders promised to stop the ‘Islamisation’ of the Netherlands. He compared the Koran to Adolf Hitler’s Mein Kampf and promised to ban it in the Netherlands. His anti-Islam rhetoric included ending immigration from Muslim-majority countries and banning the construction of new mosques. But Rutte saw off the Wilders challenge to clinch victory (albeit with less seats) and claimed that “the Netherlands said ‘stop’ to the wrong sort of populism.” Rutte was in talks with coalition contenders at the time of writing. Despite his second-place finish, Wilders is unlikely to be part of such talks. FRANCE There are at present three main contenders for the election that will conclude on 7 May. But soon there may be a fourth and decisive player who could possibly pull the rug from under the collective feet of extreme right-wing Marine Le Pen of the National Front, centrist Emmanuel Macron of En Marche! (On the Move!) and centre-right François Fillon of The Republicans. Recently, members of the European parliament voted to lift her immunity from prosecution for inciting racial hatred by tweeting images of ISIS killings. Alleged to have made payments to members of her staff for non-existent jobs at the EU parliament, Le Pen has dodged summons to appear before police and the courts to face an inquiry. Macron is considered a liberal on the economy but a leftist on social issues. In early March, Macron’s support increased two points (to 27%) from a week earlier in an Odoxa survey of first-round voting intentions. Le Pen slipped to 25.5 percent (from 27%). Meanwhile, it appears that Fillon – who is dogged by a scandal about illegal payments to his wife and family – could be eliminated from a second round runoff in May. And predictions are that Macron (62%) will defeat Le Pen (38%). However, surveys conducted in early March indicate that if Alain Juppé were to replace Fillon, he would lead in the race to the presidency. Juppé was Prime Minister from 1995 till 1997 under President Jacques Chirac. Juppé contested in The Republican Party’s primary ahead of the presidential election but lost to Fillon. Many of his party members are now urging him to return to the campaign since Fillon’s future seems bleak although he has refused to do so. GERMANY Germans go to the polls on 24 September. Merkel (who is campaigning for her fourth term as chancellor) has faced some rough seas with far-right-wing party Alternative für Deutschland (AfD) throwing its hat in the ring. AfD is a right-wing populist Eurosceptic political party that advocates Swiss-style direct democracy and dissolution of the Eurozone among other things. It is against immigration and gay marriage. And like Donald Trump, AfD also denies human involvement in global warming and is a firm critic of Germany’s energy policies, wanting it to halt the expansion of wind energy. The party also supports the reinstatement of conscription for men at the age of 18. From a record high of 15 percent in September, AfD’s popularity had plummeted to eight percent by March. The SPD, which has had a languid past, suddenly witnessed a meteoric rise by 10 percentage points and landed ahead of Merkel’s Christian Democratic Union (CDU) in three voter surveys. According to a monthly ARD-DeutschlandTREND poll held earlier this year, it was predicted that if the election was held immediately, Schulz would win 50 percent of the vote while Merkel would round up only 34 percent. German elections are still a few months away and so much can change on the political front. However, Schulz’s presence will keep Merkel on her toes. European elections are extremely dynamic where the flavour of the month can be history at the blink of an eye and new favourites are warmly embraced. Only time will tell whether the entertainers from the extreme-right are victorious or Europeans will decide to cast their ballot to retain their sober and sedate liberal status quo – as the Dutch did recently. The relationship between right-wing populist voting, dissatisfaction with democracy and consequent support for direct democracy is more complex than it appears. In fact it looks like a complexity with a number of important implications for considering the nature of democratic governance and citizen perceptions of the political process. For many supporters of right-wing populist parties in established democracies, it may be the case that, while they want ‘better’ or ‘less- establishment’ politics, they do not necessarily want more participation via elections and referenda. What I say is that, while the citizens are dissatisfied with how liberal democracy currently functions, they are not necessarily enthused by more direct democracy. It does not imply that right-wing populist voters are anti-democratic per se, but it does suggest that remedies for their discontent might focus more on promoting the responsiveness of mainstream parties.